The evolution of what?? A bad book (and a bad review). A couple of weeks ago I stumbled upon a Guardian review of the new Matt Ridley‘s book, The Evolution of Everything. In the past I read a couple of books of Ridley (The Red Queen and Genome), and the subtitle of this new one (“How new ideas emerge”) seemed quite relevant. On top of this, the Guardian review was not just negative, but full of genuine, quasi-emotional, hate for the volume, so I decided to invest some time to read it. The Evolution of Everything is, indeed, quite bad. The main problem is with the definition of evolution itself. From the first pages it is clear that Ridley uses an extremely loose definition of “evolution”, which is vaguely coinciding with any bottom-up, self-organising process. While evolution is a bottom-up, self-organising process, many bottom-up, self-organising processes are not evolutionary in a particular meaningful sense. A textbook example of these processes is the bottom-up development of trails by pedestrians. 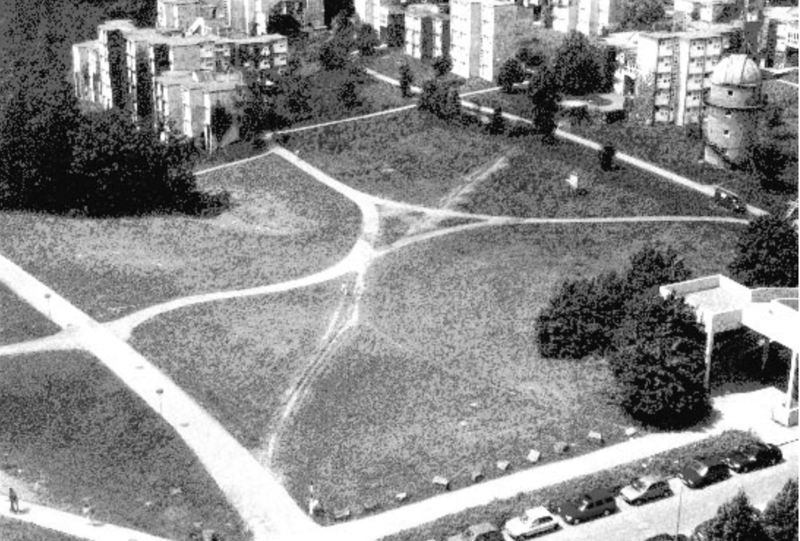 In the image below (from Helbing et al, Self-organizing pedestrian movement), the less-defined “shortcuts” in the park are created by spontaneous, non-organised, activity of single pedestrians. Each time an individual walks in the shortcut the path gets clearer, more individuals will notice it and possibly walk it, in a classic self-organising loop. All this is very interesting, but calling it “evolutionary” is quite misleading. In one of the first chapter (The Evolution of Morality), Ridley makes absolutely clear he is using this framework, contrasting, for example, the “unplanned emergency” idea behind english common-law with the designed, top-down planning, of civil-law system. With such a definition of evolution not only is very difficult to understand what is ‘evolutionary’ and what is not (I will come back on this) but, mainly, one loses all, or almost, the explicative power associated to the ‘proper’ concept of evolution (e.g. selection, heritability, etc.). Beside this – or perhaps because of this – the book has several other flaws. It is curious, for example, that just after complaining of the habit of assuming individual causation behind all events (“A battle is won so a general must have won it”), Ridley tells the story of the concept of…well…emergence perhaps…almost as an illumination of a single man-hero (Lucretius), which was re-discovered by the usual other giants of the past (Newton, etc.). In sum, the idea of “emergence” did not seem to “evolve”, after all, in the narrative of Ridley. More generally, it is not very clear what is the logic behind the organisation of the chapters of the book. It seems, at the beginning and from the title of the book, that each chapter would be the exposition of how an idea (universe, life, morality, education, etc.) “evolved” (in the sense above), but then some cases (such as “life”) are about how our current concept of it is informed by evolutionary thought, and others are mainly advertisements for the nativist views surrounding a topic (“education”). Finally, and probably because of such a weak theoretical background, risky – as a minimum – generalisations abound. My favourite is in the last chapter, when Ridley, pondering the grand message of the book, claims that “bad news is man-made, top-down, purposed stuff, imposed on history. Good news is accidental, unplanned, emergent stuff that gradually evolves. The things that go well are largely unintended; the things that go badly are largely intended.” Among the former we have “the First World War, the Russian Revolution, The Versailles Treaty, the Great Depression, the Nazi Regime, The Second World War, the chinese Revolution, the 2008 financial crisis”. Among the latter “the growth of global income; the disappearance of infectious diseases; the feeding of seven billion; the clean-up of rivers and air; the reforestation of much of the rich world; the internet; the use of mobile-phone credit as banking the use of genetic fingerprint to convict criminal and acquit the innocent”. Why it has to be so is a big mystery, as well how it was decided in which category to put the various events. Going back to the Guardian review, then, it was probably justified to be harshly critic with the book. But why to extend this to all evolutionary approaches to society and culture? Almost any paragraph of the review includes an attack to “theories of social evolution”. Here just a couple of examples: “The fact that all of these predictions have been overturned by events doesn’t matter in the least. Social evolution isn’t a falsifiable theory but a succession of ideologies”; “What Ridley does is what proponents of social evolution have always done: he fastens on some of the events of the past few decades, suitably bolstered by selective bits of history, and turns these fleeting episodes into unstoppable trends”. Moreover the support of evolutionary approaches is linked to Ridley’s personal political views and, quite oddly, to his own managerial misfortunes (“Relying on social evolution can be a risky business”). I, for example, support evolutionary views to human behaviour, and I have never been chairman of a bank. Strange, eh? So, the not-very-merry take home message here is that what the public knows on cultural and social evolution theories probably arrives from (bad) books as Matt Ridley’s one and (biased) reviews as the Guardian one. This is quite unfortunate. A growing number of people are doing a very serious work in cultural evolution. They do not generally write on widely diffused newspapers, and, while there are now quite a few very good academic books for expert or quasi-experts, we certainly still miss our Selfish Gene. Matt Ridley is an expert on evolution. To frame your criticism as a disagreement with him over what the term means seems presume that your preferred definition is better than his – something which you don’t seem to have put much effort into establishing. To be concrete, you give the evolution of park paths as an example of something which you do not consider to be “evolutionary” – in your preferred sense of the term. However, it seems quite possible to argue that it has all the essential ingredients of an evolutionary process. It consists of a population of entities (bare parches of ground) which are copied (in the minds of humans who copy paths left by previous humans). The paths also clearly vary over time and undergo selection (for example by humans deciding which paths to reinforce). It is perfectly possible to use broadly Darwinian methods to study the evolution of park paths, ant pheromone trails and other similar phenomena. You argue that Ridley’s broad conception of evolution makes the theory lose its predictive power. My perspective is more the other way around. A broad application domain for Darwinian evolutionary theory expands the predictive power of the theory – by including a much wider range of phenomena. Hi Tim, thank you for your comment. The meaning of the term “evolution” is contentious. I am not claiming to defend necessarily the better, but I am trying to stay close to the common meaning as used by the majority of contemporary biologists/philosophers of science – if you follow this blog you may know I gave some thoughts about it in the last period. Of course they could be wrong, and another sense of the term could be better suited to understand, for example, culture. I am completely open to this. But I think that the burden of the proof is on the side of who wants to use the not-common sense, or at least one has to explain the reasons for this (Ridley does not do that, or not in a very satisfying manner). Moreover, reading Ridley’s book actually reinforced my impression that this is not the way to go mainly for two reasons: (i) it is difficult to understand what is “evolutionary” and what is not and (ii) “evolutionary” explanations become really loose (any narrative of bottom-up causation, genetic influence on behaviour or similar goes). My perception is that the majority of contemporary biologists/philosophers of science have minimal understanding of cultural evolution. They are out of date – and haven’t kept up with the expansion of the domain of evolutionary theory over the last forty years. Popularity matters in science, but it isn’t as important as the truth. IMO, those who have kept up with developments over the last 40 years can say with some confidence that the consensus on the topic of the domain of evolutionary theory is just wrong. Dictionaries typically have many definitions of evolution, some of which are quite broad. There are ‘biological’ definitions of evolution – and those are sometimes tied to biological concepts such as ‘gene frequencies’ and ‘populations’ – but citing those are not going to cut much ice among those who wish to extend evolutionary theory to physics, chemistry, astronomy, geology, computer science, etc. The whole idea that Darwinian evolutionary theory is confined to biology is just an unfortunate historical mistake. I mostly agree about the ‘burden of proof’. Terminology isn’t really subject to “proof” though and sometimes bad terminology gets established and locked in. Consider “social Darwinism” for example. If bad terminology becomes popular, scientists can usually work around it – though it acts like a source of pollution in the field. Regarding your specific objections, it seems to me that the domain of evolutionary theory involves a certain petering out around the edges. Copying fidelity goes down gradually to the point where a error catastrophe happens – and beyond. Along the way, the various tools of evolutionary theory lose their utility. As far as I am aware, both broad an narrow conceptions of the domain of evolutionary theory feature a similar breakdown. The main difference I see involves what is covered, not how grey the edges are. You complain that a lot of ground is covered. Yet in science covering a lot of ground with a small number of axioms is normally regarded as a virtue. If there’s a problem with the general theory of evolution along these lines, it is to do with the constraints on mutation. Neo-Darwinism has dogmatically got by with mutations that are uncorrelated with fitness. That makes its theories quite specific and easily falsifiable. More general versions of Darwinism generally ditch this constraint – and allow other kinds of small mutation provided that they are naturalistic and explicable on the grounds of existing knowledge. That can sometimes make the complete set of evolutionary predictions more vague and less specific. I don’t think this issue is a matter of taste though: the dogmatic neo-Darwinian idea is ultimately not correct. I generally attribute the correct resolution of this issue to Donald Campbell.